Dentures, while necessary, can slip when you speak or eat. They may even irritate your mouth when food particles get wedged underneath them. They can also pop out completely when you least expect it, leaving you feeling embarrassed and less sure of yourself. You might not even be able to enjoy your favorite foods because some dentures are not as stable as you need them to be. If any of that sounds familiar, we have wonderful news. The advanced All-On-4 system has revolutionized the way dentures fit and feel. And the best part is, it can all be done in a single office visit. You can literally walk in with missing teeth, ill-fitting dentures and walk out with natural looking, stable and fully functioning teeth, all on the same day. 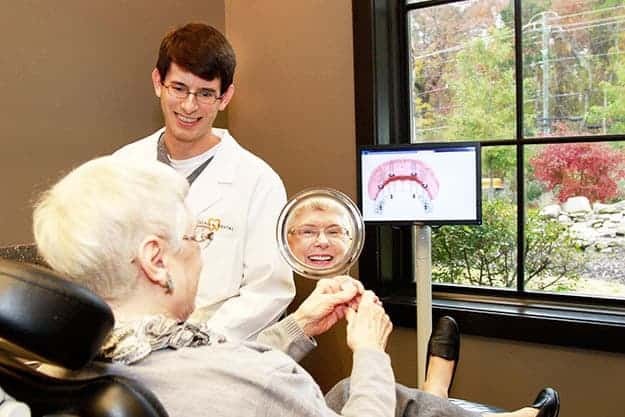 Once any necessary extractions are completed, the doctor will implant the four implants and the fixed arch prosthesis in one sitting, allowing you to feel good about yourself from the moment you get out of the chair. The ground-breaking All-On-4 system is built on using longer, carefully tapered implants which are then precisely placed in the areas where the bone is naturally denser. Once implanted, they provide an extremely stable platform for the locking fixed arch of the dentures. The procedure itself is much less invasive and has a proven record of patient satisfaction. Once the All-On-4 treatment has been completed, you can expect to regain lost bone mass as the natural pressure from chewing forces your body to rebuild the missing bone. You can say goodbye to your broken smile and say hello to a brand new you because the innovative All-On-4 treatment allows you to smile, laugh and eat with renewed confidence. Call today to learn more about Luma Dentistry’s world-class treatment options. At Luma, we love to see you smile.